Today I am going to share with you how to select the perfect mirror for your Observation Room. In fact, I am reviewing several factors in detail that may affect which mirror type you choose for your observation area. By the end of this guide, you will feel confident on which mirror to buy for your exact observation room configuration. What is an Observation Room? An observation room refers to one room that connects to another room with a window in-between. It is also called a viewing room, or back room for observation purposes. In most cases the observer wants to remain anonymous, hidden from the subject. That is where the two way mirror (observation mirror) comes in to play. With this mirror type you can be an observer hidden from view. With the addition of a two way mirror, it allows the subject to behave in a more natural way. The mirror removes the pressure from the subject in the room. This is because they can no longer tell if they are being watched. Use the steps below to help choose the best observation mirror for your situation. 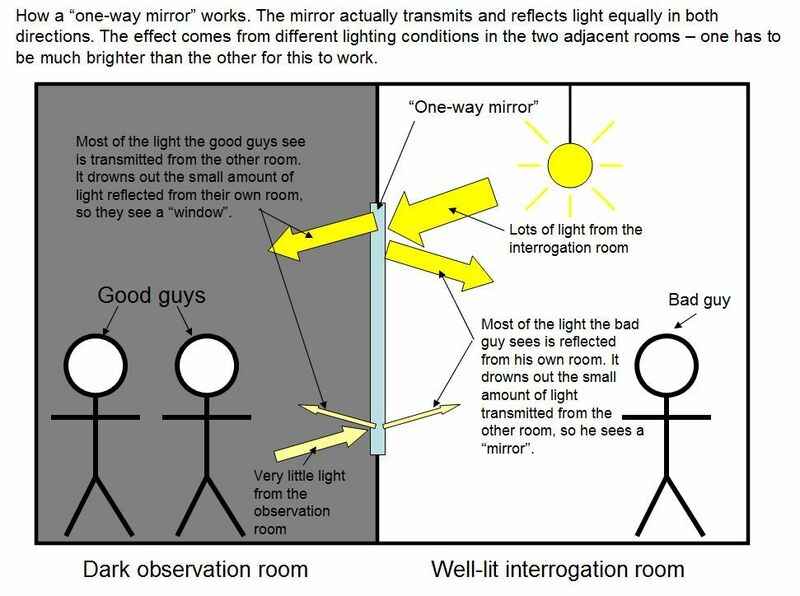 In order for the two way mirror to work for observation, you need to control the lighting in the two rooms. The observation side must be darker than the subject side. I recommend a 1:6 light to dark ratio for the best result. I know this is easier said than done. In fact, this is the most difficult requirement for many to achieve. For example, if it is going into a patient door window and the observer is in a hallway, it is very difficult to make that area darker compared to the patient room lighting. When the mirror is larger than 24″ x 48″, I would avoid the acrylic because it will appear warped. This means it will have more of a fun-house like effect. For this reason, I recommend going with a glass option. In Observation Rooms safety can be an important factor. For glass options, we can temper, laminate and soundproof it. Basically any combination of these things is possible. Laminating the glass will make it all stick together if it breaks, similar to a car windshield breaking. Tempering the glass makes it ten times stronger and if it should break, it would break into small, safe pieces. Acrylic Two Way Mirrors are the safest option because there is a very low risk of breakage. However, the mirror coating is very fragile. If there is a risk of the mirror being touched often, it could accumulate scratches over time. We can laminate each of the glass options with 1/4″ clear glass for a total thickness of 1/2″. The lead time is 1 week until shipped. Tempering is available for the glass options. The lead time is 1 week until shipped on tempered pieces. Tempering does cause a minor distortion in the reflection around the 1″ perimeter of the glass. If this is a deal-breaker, consider laminating to avoid the distortion. Yes, we can temper and laminate the glass mirrors for even more protection. Just in case you need the best protection we have to offer. Learn more about our ballistic mirrors. The usual thickness is 1-3/16″ overall but can be customized for the level of protection you need. When you create a hole in a wall, there will be some sound leakage. This could be a problem if the observer will be talking with other observers/people in the observation room area and you don’t want to be heard. The usual overall thickness for a Soundproof Glass Two Way Mirror is 1″. Please contact us for a quote and include the desired thickness you would prefer. When you are recording through a two way mirror, video quality is a concern. The Glass Two Way Mirror is only 11% transparent, so the video quality will be dark. If you need better recording quality, use the Acrylic Two Way Mirror or Glass Smart Mirror. They still have a high reflection so it will hide the observation side completely as long as it is darker than the subject side. For more information and comparison pictures on recording, check out our Hidden Camera article. Add lamps and additional light fixtures near the mirror to help increase the reflection on the subject side to hide the observation area better.